All wood floors make noises (or eventually will). It is part of living with a natural, organic product. A product that is hygroscopic and reacts to its ever-changing environment will likely move around throughout its service life and develop some sort of squeak, crackle, or pop. An occasional squeak within any properly installed wood floor system is not abnormal. 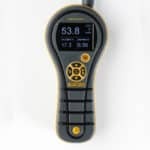 These noises are not always a direct concern with the installed wood floor as long as the movement accompanying the audible squeak does not affect the performance of the installation. However, the fact that all wood floors make noises does not insinuate that they are supposed to, or that they have been manufactured to make these noises. Many squeaking and popping noises originate from the subfloor system below the floor. 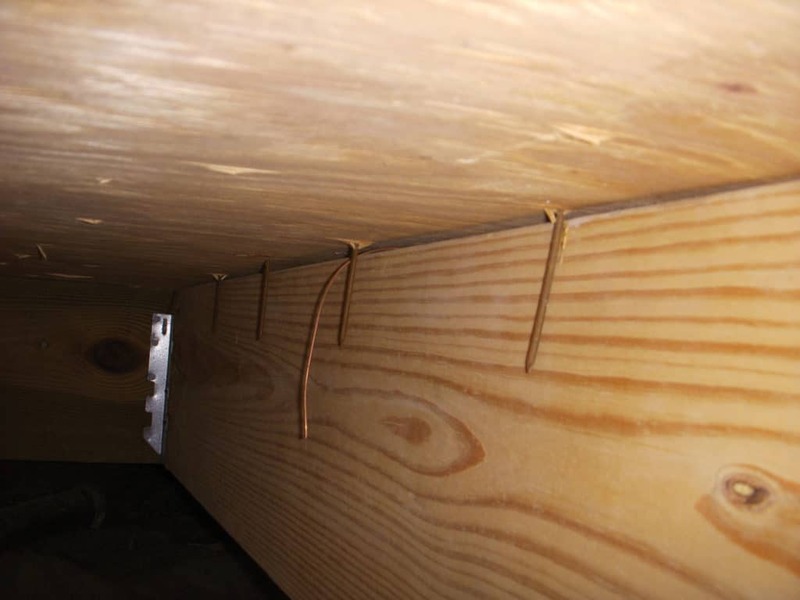 Some of the most common causes of a squeaky floor originating from the subfloor system include poorly nailed subfloor sheathing, missing joist hangers, missing nails or nails that just miss the joist, improperly installed subfloor sheathing, improper application of subfloor adhesive, and excessive shrinkage of subfloor materials. As wood floor installers, we often do our best to address existing squeaks in wood subfloors, but it is not normally something that the wood flooring professional is responsible for fixing unless we’re otherwise contracted to do so. One trend we have seen within our industry over the last couple of decades has been the movement toward engineered wood flooring. There are many reasons, but improved stability is one major factor. With improved stability, you would expect fewer squeaking, popping, and crunching complaints. 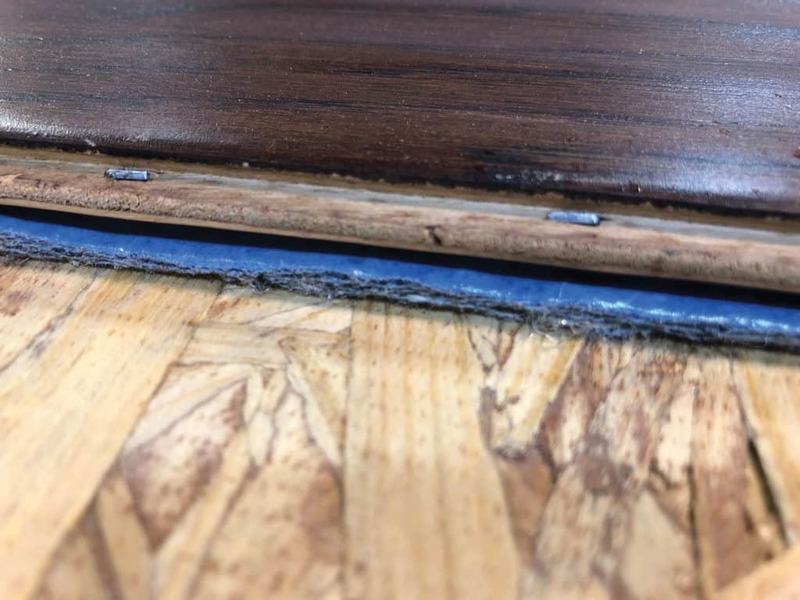 To the contrary, one of the more common issues we have heard of through our technical call center is directly related to squeaking, popping, and crunching noises in installed engineered wood floors. Following are a few of the more common causes of squeaking, popping, and crunching noises in installed engineered wood floors. The NWFA standard for subfloor flatness on a nail-down installation is 1/4″ in 10′ or 3/16″ in 6′. When subfloors are outside of the flatness tolerances, voids are created that allow the flooring to move vertically, resulting in a noisy flooring system. It is almost always necessary to expect that the subfloor seams will need to be sanded flat as part of jobsite preparation. When the subfloor seams are not sanded flat, the result is normally a subfloor that is not within tolerance. Subfloors that are not properly scraped or cleaned before installation can also cause similar voids or high spots that can result in a noisy floor system. Dried globs of drywall mud, paint, grout, or other construction materials not adequately removed from the subfloor will also adversely affect the flatness of the substrate and result in a noisy floor. 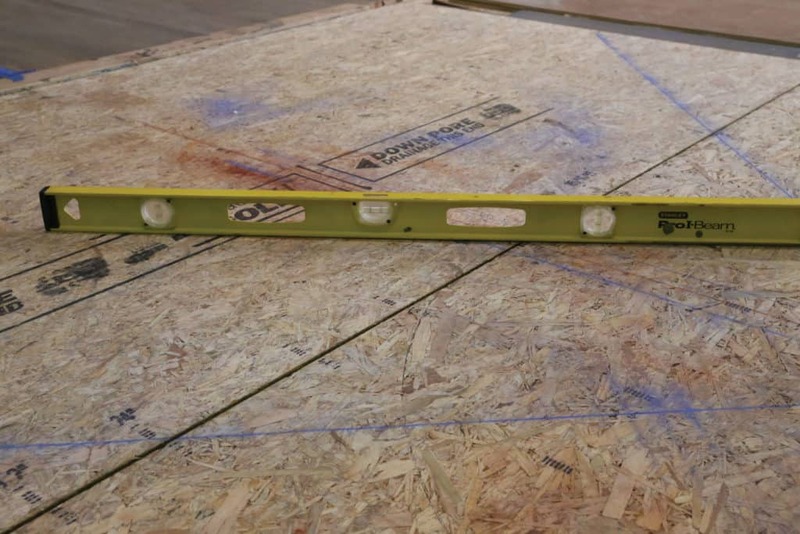 As the availability of slow growth plywood fades and economics come in to play, builders are moving to OSB for their new construction subfloors. OSB can be a good subflooring option, though different performance levels exist. The wood flooring industry has bemoaned the use of commodity OSB products due to swelling after exposure to the multiple wetting/drying cycles experienced during the build. We know that swelling can occur with any wood product when exposed to water. 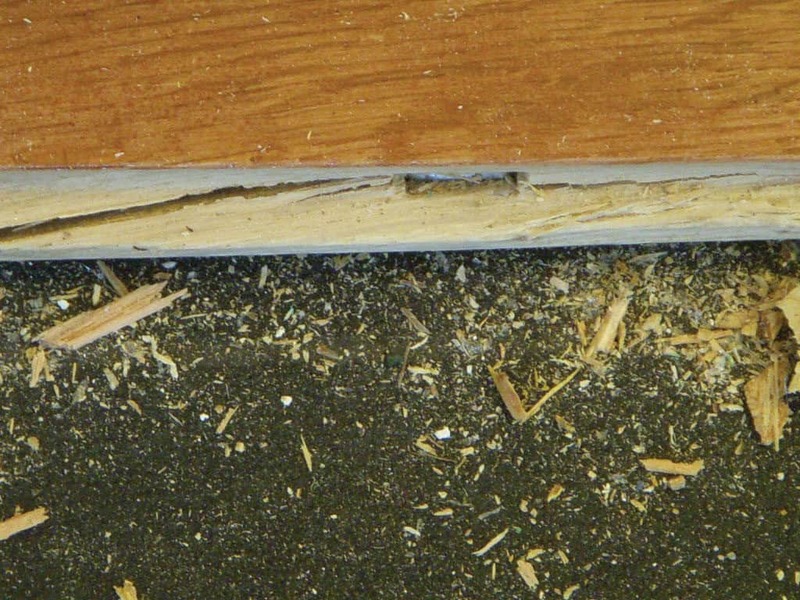 In OSB, this swelling can create a decrease in fiber density and a degradation of bond strength between the strands, especially at panel edges, causing a reduction in wood flooring fastener retention. The loss of fastener holding can directly impact the performance of otherwise properly installed engineered wood flooring. The recommended fasteners used when installing engineered products are normally 18-20 gauge cleats or narrow crown staples anywhere from 1″ to 1 1/2″ in length. These types of fasteners require a much tighter fastener schedule than the heavier gauge, longer-length fasteners used to install 3/4″ solid and engineered wood flooring. In general, for engineered flooring, fasteners should be placed every 3″-4″ and within 1″-2″ of the ends of each plank (unless otherwise suggested by the flooring manufacturer). The truth is, 1″ fasteners used to install engineered wood flooring only penetrate the subfloor 5/16″ (for 5/8″ flooring) or 1/2″ (for 3/8″ flooring), and when used over the previously wetted OSB subflooring, they have very little to hold on to. 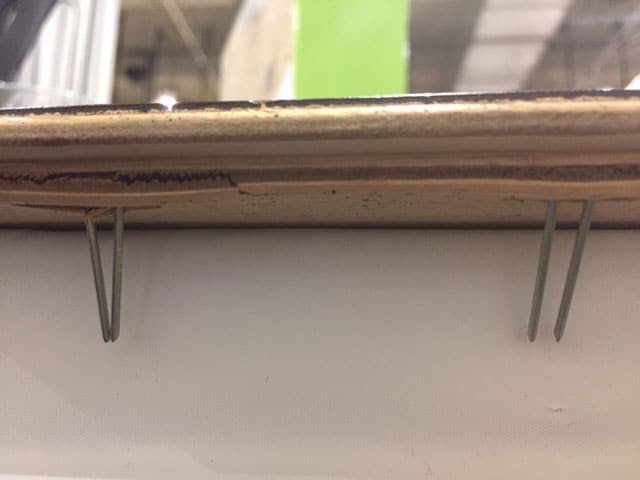 between 3 and 4 fasteners per square foot on a 12″ wide plank. More fasteners are not always feasible. Alternative installation methods such as full-spread or glue-assisted installations are sometimes a good alternative option. These options over wood subfloors are only acceptable when moisture is 100 percent controlled from below the flooring system. Further discussion on this topic is one for another article. It is not uncommon for a crew to use an undersized compressor or to have several nailers running off one compressor at a jobsite. 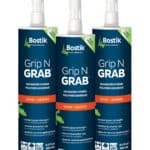 Without an individual regulator on each hose, the compressor will not be able to deliver air pressure consistently to each nailer throughout the installation. To compensate for this, some crews will turn the PSI up on their compressor. This causes too much air being delivered to the nailer when the tank is full, resulting in overdriven fasteners, and often accompanying cracked tongues. When the tank is depleted of air, the compressor cannot deliver enough air to the nailer, resulting in underdriven fasteners. This causes staples or cleats that are not fully seated into the tongue of the flooring product. When either of these occurs sporadically throughout the installation of the flooring system, it is not uncommon to hear crackling and popping from the improperly driven fasteners. When using trigger-activated flooring nailers (where it is common to use the gun while out in front of the floor being installed, rather than standing on top of the floor), it is common for flooring installers to use the pneumatic pressure of the gun to draw the boards tightly together, rather than use a mallet or tapping block. This action, accompanied by limited to no downward pressure being applied to the plank, can result in blow-out. Anytime the floor is not driven tightly together or tightly to the subfloor, it may result in a noisy floor after the entire unit has been installed. A relatively new cause for noisy floors is related to installation methods over acoustical underlayment material. Acoustical underlayment materials commonly used under wood flooring systems include cork, foam, rubber, and many recycled cellulose fiber pads. Proper installation methods over these underlayment materials may include floating, glue-down, or nail-down over a floated wood subfloor. None of these materials are designed to hold a fastener. The fastener withdrawal resistance becomes greatly diminished and will result in a loose flooring system. The density of these underlayments will compress when a fastener is driven through, driving the flooring tight to the substrate. This forces the flooring out of a flat pane and results in vertical movement within the flooring system. The creation of pivot points/anchors within the flooring system. Anytime the floor is not driven tightly to the subfloor, it will result in a noisy flooring system after the entire unit has been installed. Keep in mind, most manufacturers who promote these installation methods do not warranty against squeaking. Many of the causes of squeaking, popping, and crunching sounds that come from the flooring system are avoidable. 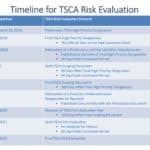 It takes combined collaboration between the builder, the end-user, the involved manufacturers, and the flooring professional to be able to mitigate the causes. 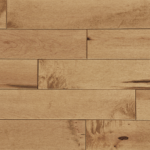 There are several ways to address noisy floors in substrate systems, as well as many options to address noises originating from installed wood flooring systems. 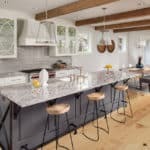 However, if the flooring system exhibits no vertical movement that affects the in-use function of the installed wood floor, the noises are likely something that is considered perfectly normal. Check out the latest Problems, Causes, and Cures Technical Publication No. C200 for information on other sounds, noises, and movement within the wood flooring system. Next Tech Talk: What Was the Most Unique Subfloor Prep Situation You’ve Encountered and How Did You Handle it? 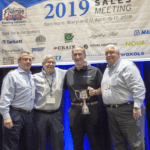 Welcome to my world of consulting rather than simply inspecting and being bound by the “rules” of the hardwood flooring industry. I’m speaking specifically about the section on acoustical underlayments where it is correctly stated that some manufacturers promote directly nailing through these products. The author, with the approval of the article review committee, states that “This is not an appropriate installation method”. Since all articles published in this magazine are reviewed and approved (due to the official capacity of this publication) this statement becomes a quotable statement of an official industry position. I agree with the statement that this is not an appropriate installation method. This position is not what I am drawing attention to in this response. I want to highlight the apparent conflict we have with the idea that the manufacturer’s guidelines always supersede the generic or NWFA standards for all sorts of issues. In this instance, we have the NWFA’s official publication definitively stating that the manufacturer’s recommendations are wrong. I do this with some regularity in my daily work as a consultant. I have had manufacturers change their installation instructions as a result of my work in exposing their errors. Sometimes these manufacturers are even glad I brought these issues to their attention. Oftentimes they are not happy since their recommended product or practice is a profit center for them, as in this example. Welcome to my side of the field. I must agree with Dave. The NWFA always states that the manufacturer’s rules always supersede the NWFA. To Dave’s statement who do I quote, the manufacturer who says to nail through the sound deadening underlayment because their rules are believed to be correct or use an article like this one and state it is not acceptable to nail through the underlayment. I too have personally seen installation guidelines that are incorrect. I believe some manufacturers just cut and paste things from other sources without really reviewing what they are putting in their install guidelines. My point, particularly in this case, is the NWFA now appears to be saying that the manufacturer’s rules are not always correct. That would have to mean they DO NOT always supersede NWFA rules. I have had inspections for this exact issue where a major wood floor retailer whose name I will not mention promotes this exact type of installation. The flooring appeared tented throughout and squeaked. If you were me where would you place blame? Frankly, I think this article opens a can of worms. 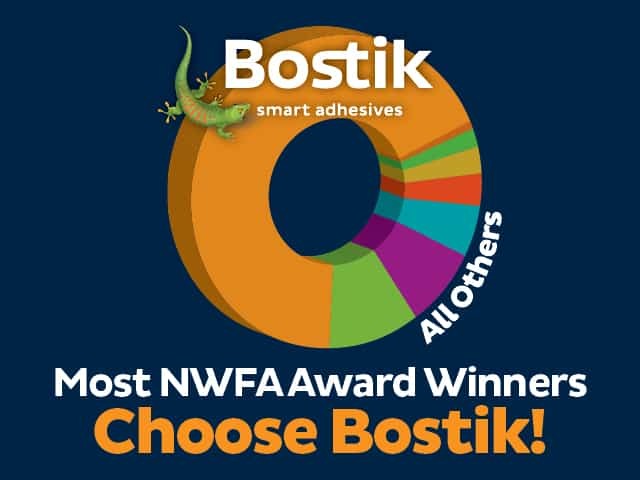 Just maybe the NWFA should be getting involved with some of the manufacturers that create installation guidelines that benefit sales of a product that is not suitable for the intent for which it is being promoted and sold for. 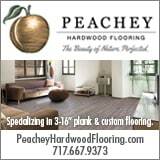 Would I be correct that some of these manufacturers advertise in Wood Floor Business or Hardwood Floors magazine? Maybe someday we will be allowed to say that the manufacturer’s acclimation instructions are largely BS and misleading. Manufacturers that tell you to “acclimate” the cartons on site for 48 or 72 hours are causing more trouble than they can imagine. Letting the cartons set in a home for 3 days often accomplishes next to nothing other than inconveniencing the occupants of the home. While we’re at it, how about fastener schedules that are different from those of the NWFA. Is brand A flooring really best able to perform when nailed at 8-10″ instead of 6-8″ intervals? Is their wood magically superior to every other manufacturer’s on this point? And what about floating floor manufacturers who don’t require transitions in doorways or limit maximum room dimensions? At best their installation instructions are incomplete while at worst being outright dishonest as they try to gain a sales advantage over their competitors. In the end, it all comes down to right being right, regardless of who says it, even if it is little old me.